We welcomed Andrew to our SERVPRO of Wood River Valley team in September 2017 as our PRODUCTION PROJECT MANAGER. Andrew was raised in Jerome, and now lives in Twin Falls with his amazing wife Jessica and their two beautiful girls. They plan on raising their family and enjoying the beauty and wonders of the magic valley for many years to come. Andrew and his family enjoy traveling, shopping, biking, and trying new things. Over the years working different markets, including spending 4 years in California has developed his extensive customer service. 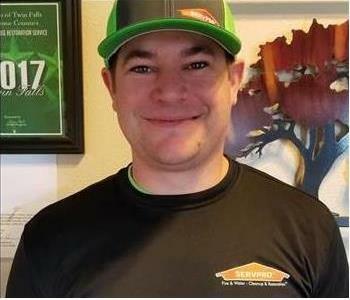 Andrew brings over 10 years of customer service to SERVPRO, “people helping people” is one of the moto’s he lives by, as well as Self-motivation, hard work, focus, and determination is what Andrew strives for each and every day. With that being said, every customer is going to receive the most professional level of service from SERVPRO twin falls. This is important because when we meet customers for the first time it’s usually when disaster strikes. From a water loss, fire loss, or mold issues you can count on the ultimate goal of world class service, every customer every time. Patricia has been with the company since April 2017 and she is our Office Manager at SERVPRO of Wood River Valley. She has earned her certificate in administrative assistant and possess an associate degree in business. 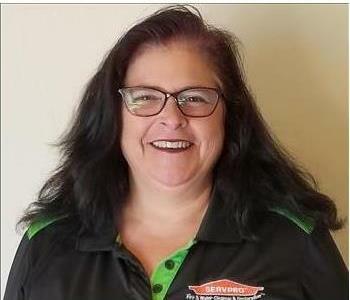 Patricia bring to SERVPRO 15 years experience of customer service. She is certified as a CCT, Carpet & Upholstery, Water and Fire & Smoke Damage Restoration which is a great asset. Her job knowledge gives our office an edge with customer service. She has also completed her II CRC WRT Training. Patricia plans on making a future with SERVPRO, and we are glad of that. 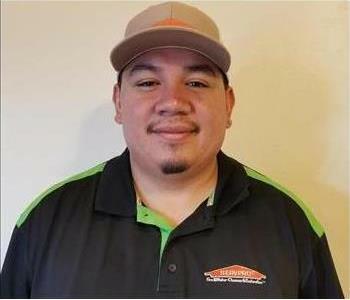 Leo joined our SERVPRO of Wood River Valley family in July of 2017. He graduated from Minico High School in 2016. He has lived in the Minidoka County since he was two and is like another local native. Leo is currently matriculated in college taking Business Management. His goal is to be his own boss and lead the way for others in life and in work. He feels that working here with our team will help contribute to that goal. Leo is excited to learn and grow with the company. 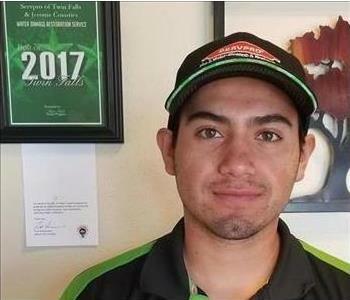 Gabriel Martinez is a Crew Chief for SERVPRO of Wood River Valley. He game aboard to SERVPRO with his IICRC certification in Water Damage Restoration WRT and Applied Microbial Remediation AMRT, and 7 years experience of mitigation. Gabriel plans on remaining with us for the long aul with is ultimate goal of becoming a mitigation manager. Gabriel is married and has 6 children that he works hard to support. 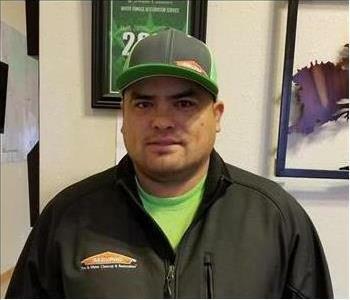 We welcome Gabriel and his family to our SERVPRO family. 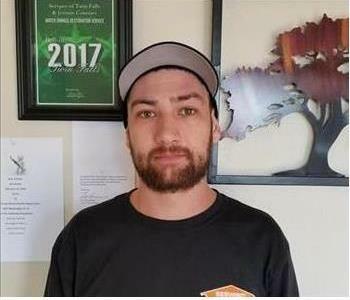 Robert Richards is a Production Technician with SERVPRO of Wood River Valley and plans on being part of our great team for many years to come. He plans on making a career with the company and go as far as he can. Robert arrives with four years of HVAC experienceand certification in PLB Spec Apprentice and HVC Apprentice. This adds to our expertise as a franchise. Robert is married and has four children. Griffin grew up in Seattle WA. and in 2013 He moved to Twin Falls to marry his Sweetheart. They have one son and live in Twin Falls, ID. Griffin has had the opportunity to work in the construction trade as well as sales and insurance. Coming from the insurance world he understands the devastation and fear that comes with a disaster. He bring a wealth of knowledge to the SERVPRO of Wood River Valley team as well as a unique perspective in the restoration process. When he manages to find a little free time Griffin enjoys fishing, hunting, and camping. Of course, family and friends are part of these activities. Athena Havener joined SERVPRO of Wood River Valley in August 2017. She started as a temp worker and with her hard drive and dedication we hired her on full-time and she quickly became our first female crew chief. She grew up for the most part in the Kimberly and Pocatello area. She now calls home Twin Falls with her three sons. She plans on making her career here at SERVPRO and raising her sons in the Twin Falls area. She loves spending time in the great outdoors fishing, hunting, and riding horses, and whatever else comes along. Athena has earned her IICRC certification in Water Restoration Technician (WRT) and Fire Smoke Restoration Technician (FSRT) to tack on to three years of hospitality & Customer Service. Athena has been a great asset to our team. 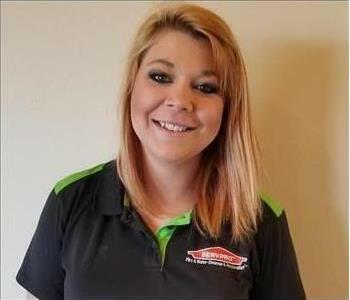 Maria began working at SERVPRO of Wood River Valley in March of 2018. She is our content technician, a key position for cleaning and restoring personal treasures. Maria is a very hard worker and pursues each task with diligence and energy. She has a pleasant personality and a joy to be around. She relocated to Twin Falls from California 11 years ago. Hard to believe that she has 4 children and 6 grandchildren. In her spare time, when sh can find some, Maria enjoys dancing and spending time with her family. 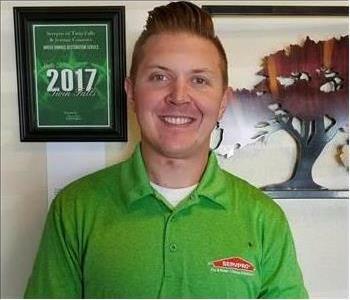 Andy has been working for SERVPRO of Wood River Valley since September 2017. Andy is our Reconstruction Project Manager and he take pride in his work. He spearheads a vital cornerstone of our services. Andy bring years of experience in restoration construction and he plans on sticking around for a long time. And we all hope he does. 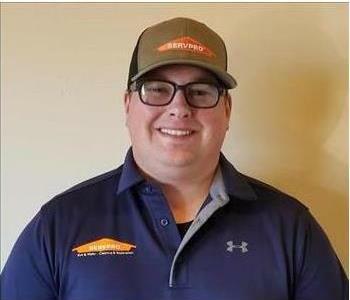 Joe joined SERVPRO of Wood River Valley team in July 2018. 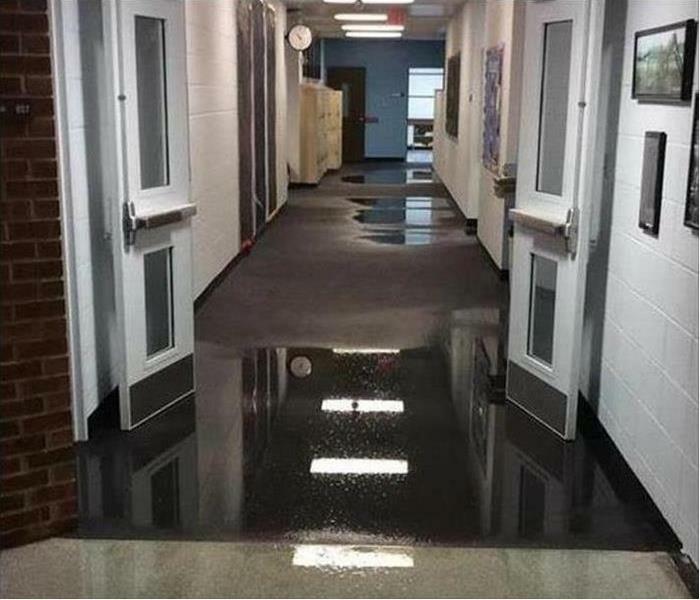 Joe's first exposure to us was when he experienced a water loss. 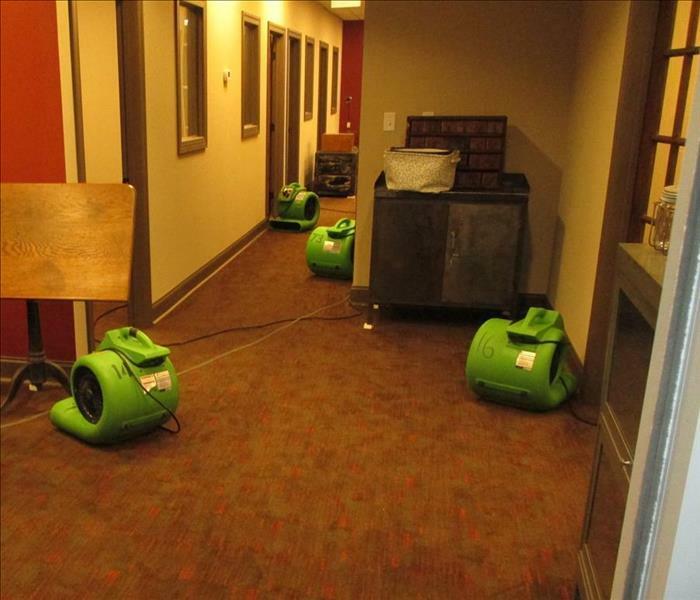 He was impressed with our technicians and office staff during this experience. When Luke discovering he was seeking employment, he offered Joe a position with our team. Joe quickly found a niche with his new line of work and he quickly became a crew chief. He strives for anything that is required of him and he is always learning new techniques and methods. Joe is very grateful to reside in Twin Falls with his beautiful wife and two daughters. In his spare time Joe enjoys exploring the beautiful outdoors, especially camping. Joe is planning on continuing his training, achieving more certifications and hopes to oneday become a project manager. We believe he can.